Okay, first of all...let me totally start off by having my fangirl moment! Welcome to the book spotlight of Chicki Brown's latest book: Till You Come Back to Me by Chicki Brown, book 2 in the Stafford Brothers series. I've made it no secret how much I adore book series that are based around families and this is a new family for me to fall in love with! I've also made it no secret to Chicki how eager I've been to read this book ever since I read her first book A Woman's Worth. Can I just say, I love the titles and how they (I'm assuming) are based off of songs! Every time I see the title of her latest book I think of Aretha Franklin's song! :-D Now the song is playing in my head....So I'll share it with you! Let's get back to the book! Chicki has been gracious enough to share an excerpt with us today! Atlanta plastic surgeon Charles Stafford is giving up his successful practice to volunteer his services in Nigeria with a medical organization. Even though he’s excited about this major career move, he has no idea how much his life is about to change. Nurse Adanna Okoro is one of the six medical professionals working at a small village hospital thirty minutes outside of Lagos, Nigeria. She loves her job and is devoted to the people she serves. When the hospital is notified that it has been chosen to host a team of foreign doctors, Adanna meets the man she has always dreamed of. The hospital staff and their guests settled under a white canopy covering two tables laden with bowls and platters. Nurse Okoro introduced their servers, three women from the village dressed in colorful traditional clothing and head wraps. Dr. Ijalana asked the women to serve the assistants first and instructed them to take turns checking on the patients. Charles bowed his head and silently offered a prayer over the food. Even though it smelled wonderful, most likely it contained ingredients he would never have eaten. The facilitator at the briefing mentioned the necessity of being careful not to insult the locals in any way, and one of those ways was by refusing food they had prepared. When he raised his head and opened his eyes, Nurse Okoro was studying him with a hint of a smile. The new combined staff got to know each other while they ate. Charles took a few minutes talking with the two local doctors and the other nurse before he settled in the seat next to Nurse Okoro. He nodded toward his plate. “Can you tell me what all of this is?" "We asked the three best cooks in the village to prepare your first meal, and requested they fixed only chicken and vegetable dishes." He listened intently while she described the assortment of rice dishes, fruits, and vegetables in detail. "Really? That's not far from where I live. Are you satisfied with your accommodations?" "So far. We only had time to unpack before the car arrived to bring us here." The way Dr. Pategi suddenly interrupted him, Charles wondered if he’d been ogling her. He gathered his senses and concentrated on her words rather than her face. 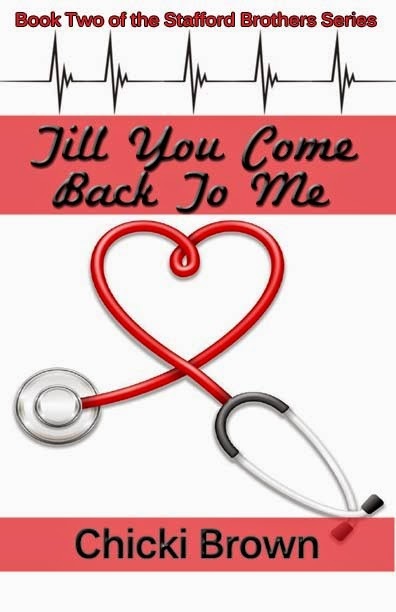 You can buy Till You Come Back to Me on Amazon! I hope you've all enjoyed the excerpt! Make sure you go and get this book! Of course I've got my copy!!! Thanks so much for sharing this with your readers, Te'!